WFCCA was born in May of 1982 at the First Annual Wisconsin Family Day Care Association conference in Madison, WI. A steering committee of volunteers from each of the 6 regions in the state was formed to lead this new organization. In 1993 the organization changed its name to Wisconsin Family Child Care. This change reflected the growing recognition that Family Child Care is a valid profession and that quality child care is more than babysitting. 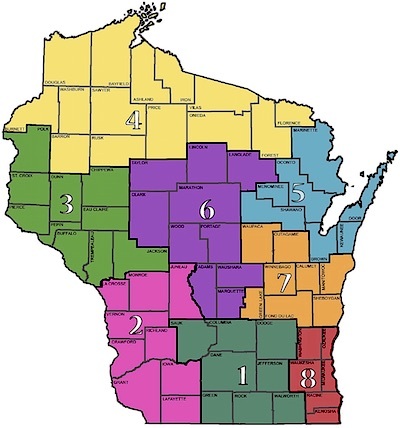 Over the years the original 6 regions grew into 17 regions. In May 2018 the 17 regions were reorganized into 8 and an additional Regional Rep position was added to each region. The Wisconsin Family Child Care Association is governed by a Board of Directors who are elected by WFCCA members. The Board consists of Executive Directors, Operational Directors, and Regional Representatives. Each region is represented by WFCCA members who live in that region. If you're interested in filling an open position in your region, click "Volunteer" for more information. Columbia, Dane, Dodge, Green, Jefferson, Rock, Sauk, and Walworth Counties. Crawford, Grant, Iowa, Juneau, La Crosse, Lafayette, Monroe, Richland, and Vernon Counties. Buffalo, Chippewa, Dunn, Eau Claire, Jackson, Pepin, Pierce, Polk, St. Croix, and Trempealeau Counties. Ashland, Bayfield, Barron, Burnett, Douglas, Florence, Forest, Iron, Oneida, Price, Rusk, Sawyer, Vilas, and Washburn Counties. Brown, Door, Kewaunee, Marinette, Menominee, Oconto, and Shawano Counties. Adams, Clark, Langlade, Lincoln, Marathon, Marquette, Portage, Taylor, Waushara, and Wood Counties. Calumet, Fond du Lac, Green Lake, Manitowoc, Outagamie, Sheyboygan, Waupaca, Winnebago, Counties. Kenosha, Milwaukee, Ozaukee, Racine, Washington, and Waukesha Counties.